Parties are booked no less than four weeks in advance. When your party is booked, I will send you a link to an online photo album, you will pick five designs and add them to my website for ordering. Your friends can each then pick what design, from those five, they would like to create. Also, if any of the hostess' guest book a party within 48 hours, the hostess will receive half off sign if they attend their friend’s party!! You choose 5 signs from our over 400 designs for your friends to pick from. Prices start at $22 and go up from there based on size; the average cost is around $30. When you have 10 friends sign up yours, the 11th, is half off. There is a $20 deposit required to hold your date. To help us prepare the supplies for your custom project, we may need you to pick a design or add customization to your order. Please be sure to enter the info EXACTLY how you want it as once your order is placed NO CHANGES can be made once your order is submitted and there are NO REFUNDS. We can come to your location or you are welcome to host in our store. In home there is an 8 person minimum and 10 person minimum in store. In store you are welcome to bring any food or drink of your choice; we do not supply any of the paper products though. We will bring everything needed for you to create a one of a kind sign for your home. In this workshop, you'll be able to customize your project by picking from over 30 latex paint colors and all sorts of painting and distressing techniques. 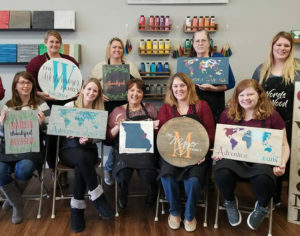 If for some reason you are unable to attend, I will have your materials with me and I can give them to the party Hostess for you to make the sign yourself at home with your own paint or you may attend one of my open workshops and bring your already purchased sign with you to create. If you are interested in booking an event with us, please send us an email request and we will get back with you to discuss details.